Soft sand, beautiful homes, and dynamic conditions for skimboarding! Victoria Beach is a visually stunning beach which features both beautiful views of the ocean and views of some of the amazing homes which make South Laguna such a unique place to live. Victoria Beach is a long sandy beach, with several prominent historic features, including the historic tower with enclosed spiral staircase. The Victoria tower was built in 1936 and is no longer in use. Often, the waves break right on the shore producing ideal conditions for skimboarding. Conditions are usually so good, that local Victoria Skimboards was inspired by this very beach! Tabu Grill and Dizz’s As Is are both within walking distance of Victoria Beach on Coast Highway. 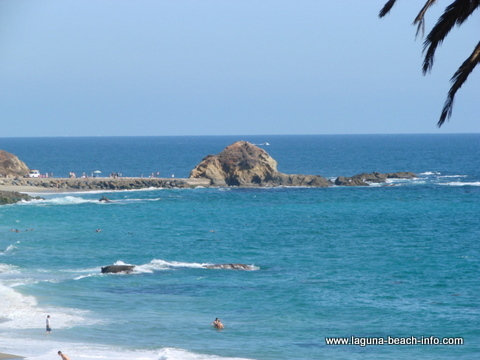 Or you can browse additional Laguna Beach Restaurants within a short driving distance. Metered parking near Victoria Beach can be found along Coast Highway and nearby side streets. If you don’t want to pay for parking and don’t mind walking a bit to Victoria Beach, you can often find free parking farther up in residential neighborhoods- always use caution and don’t block anyone’s driveway! Victoria Beach is located at Coast Highway and Victoria, and can be accessed by walking either down the stairs at the Coast Highway overpass, or through Nyes that leads to the tunnel.